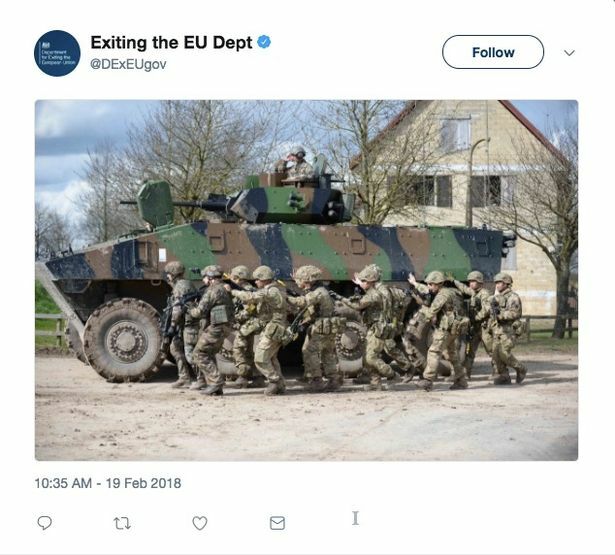 The Government department in charge of Brexit just tweeted a picture of a tank, sending Twitter into confusion. Shortly after 10.35am, the official DExEU Twitter account posted the picture of an Armored Personnel Carrier (APC) flanked by troops rolling through a village. The ominous tweet didn't include any words of explanation or context for the image. It's left some people concerned that David Cameron 's much derided warning ahead of the Referendum that Brexit would be like World War III might have been right on the money after all. The picture appears to be from a joint training exercise between the British and French armies. But it only gets more awkward when you know the real reason behind it. I don't like giving advice to foreign govts. It's not my business and I'm not involved. To be actual and factual I really don't care. But this Brit business with Brexit is becoming an embarrassment. Either do it or don't. But whatever you decide to do, do it quickly!